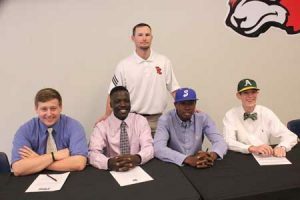 Four Predators signed with colleges to play baseball last Thursday afternoon in a ceremony held in the school conference room. Brandon Stallings, far left above, signed with Spartanburg Methodist College and Terrance Hillary to his immediate right signed with USC-Sumter. They are joined by Darshon Broadwater, second from right, who signed with Spartanburg Methodist College and Roby Gillespie, far right, headed for Abraham Baldwin Agricultural College. Head Coach Wes Brown joined his players for the ceremony.